McGregor's a domestic level boxer, at best. 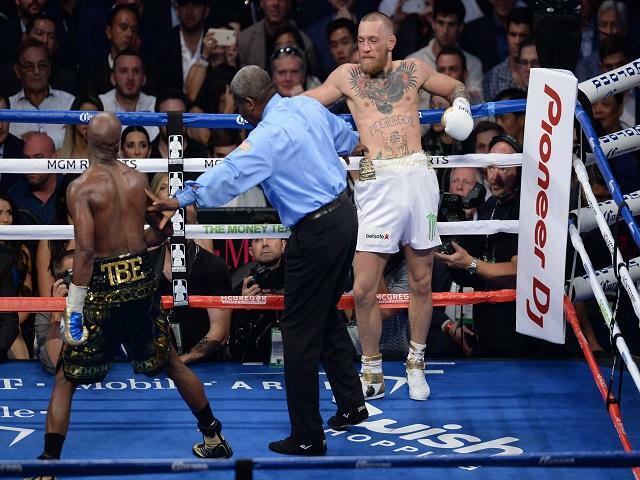 "At best, McGregor is a domestic level boxer, so what’s the point? Would anyone really want to see him in with the likes of Bradley Saunders for a few quid, and on the losing side?" Floyd Mayweather vs Conor McGregor went the way most sane punters thought it would, and followers of my preview were quids in, backing Pretty Boy by KO/TKO as well as the American in rounds 7-12. Easy money. It was never going to be the early night some predicted. Floyd is too wily to be caught cold, even after a couple of years on the sidelines, and he's too long in the tooth to put his unbeaten record at risk by coming out all guns blazing. An argument could be made for the victor timing it right, ensuring supporters got their money worth. Whatever your view on that one, there's no doubting Mayweather - who moved to 50 fights unbeaten, passing the great Rocky Marciano in the process - deserved his win. He dragged his opponent into deep water and held his head under. A premature stoppage cried some. McGregor certainly wasn't complaining too much when looking gassed, unable to throw back. Referee Robert Byrd saved him to fight another day, and for that he should be thankful. It's a sport and a painfully short career, easy to forget from the sofa. So, what's next for both men? Will Floyd Mayweather Jnr put his neck on the line and step into the octagon? Laughable, but you never know with him. There would certainly be another earth-shaking pay-out in it for both men, and any defeat wouldn't affect the unblemished boxing record Floyd holds dear. We'll say no, those who have followed Mayweather's career will say not a chance. Entertaining, but unlikely. It's more likely TBE will retire, stepping away from boxing with a winner's cheque that'll set him up for life. He has a thriving management and promotion business running away in the background, with some of the sport's most promising names on his books. That will certainly keep him busy in the long-run, keep him earning and keep him involved in the sport he loves, and the sport that loves him. Any American Olympian turning over could do worse than be guided by Mayweather Jnr. He'd also fancy eclipsing the work done by Oscar De La Hoya over at Golden Boy Promotions. Mayweather is not without his haters, as he likes to call them, but if Saturday was the last time we see him in a boxing ring, fight fans would love to thank the 40-year-old for his service. He has done it all, won it all, and the game will miss his presence. For a reminder of just how good Floyd was before taking to stopping MMA fighters, simply flick through the names on his record. He deserved Saturday's golden handshake. What's left in boxing for Conor McGregor? The poster boy of UFC also received a whopping pay-day for the cross-over, but the fast-talking Irishman, who promised to take control of the sport, left with more questions than answers. His boxing skills were shown up to be average, at best, and although he told reporters in the post-fight press conference that he was getting success in the early rounds, the only success he got was the success Mayweather allowed him to have. The naturally heavier, younger man was walked down by a Floyd who hasn't pressed too many fighters in recent years. Is there any room for him in the sport? It's hard to say. The obvious opponent for fans would be Paulie Malignaggi, following that sparring clip and war of words. But Paul would stop him too, and without much fuss. He did a bit in camp when retired and off the pace, with a proper training regime under his belt, Conor wouldn't lay a solid punch on him. Would too many be interested in seeing that? I know it couldn't top a bill on a big show alone. You'd need two or three big fights to support it. Best forgotten about, in my book. At best, McGregor is a domestic level boxer, so what's the point? Would anyone really want to see him in with the likes of Bradley Saunders for a few quid, and on the losing side? Amir Khan and Manny Pacquiao stop him. Alvarez and Golovkin. I don't even want to think about it. It would be bordering on bullying after what we saw in Vegas. Back to UFC it is then, and there's plenty of high level bouts there, back where he belongs, and back paying the kind of wages he's earned in the octagon. The 29-year-old's next fight will be in UFC, we're certain of that. Jose Aldo and Nate Diaz are options, and they would catch the imagination of MMA followers. The most likely opponent looks to be Khabib Nurmagomedov, strictly for the sport's purists. The times of boxing fans staying up late to watch McGregor fight have been and gone. The Betfair Sportsbook is offering McGregor fans a number of exciting specials, including 4/1 his next bout not to be a UFC sanctioned fight, 8/1 he'll become a boxing world champion during his career, or 16/1 a boxing and UFC champion at the same time.